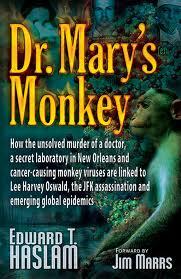 Dr Mary’s Monkey also relies on police reports, Freedom of Information Act records and the secret files of ex-FBI agent Guy Bannister (who played a key role with Oswald and Ferrie in a secret CIA program involving anti-Castro emigres), as well interviews with scientific and medical experts and acquaintances of orthopedist Dr Mary Sherman*, who was conducting secret SV-40 research at Tulane at the time of her apparent murder. This entry was posted in Medical Censorship, Things that aren't what they seem and tagged american cancer society, David Ferrie, dr mary sherman, edward haslam, galloping cancer, JFK assassination, jfk records act, jim garrison, Lee Harvey Oswald, national institutes of health, nih, polio vaccine, siv, sv40, tulane, vaccination, Warren Commission by stuartbramhall. Bookmark the permalink. I am almost sorry that I read this because if I wasn’t consumed with rage before, I am now. My father’s family was almost entirely wiped-out due to cancer. I have attended so many funerals that were back-to-back because of this and getting taken out of here by cancer is a most horrifyingly painful way to go and what it does to those who are the loved ones and caregivers?,…well, there just ain’t words for it! It makes me sick to my stomach to reflect on how cheaply policy makers hold human life. It’s a form of slow genocide really. I think some of these officials should be tried at the International Common Law Court of Justice in Brussels – when they get finished trying the Catholic Church hierarchy for all the indigenous children they have killed. Dr Mary’s Monkey is laughable,do not believe this farce. None of the accused are alive to defend themselves,convenient for the author though. Interesting link. The problem I have with the bush meat theory is explaining how a virus with relatively slow transmission (only through contact with secretions) suddenly infected large populations of gay men in the US. WHY DOES EVERYTHING START IN BAY AREA? DR if LHO was MK ULTRA guinee pig could it be posable that they used his childhood ear operation to mask inplanted electrodes? You have an informative and non-traditional site pus links to numerous individuals worth my taking the time to check out. This is thefirst complete blog of yours I’ve read and it never ceases to amaze me to what lengths we’re prepared to travel in order to destroy the human race. People seem to be very short sighted in their single minded search for profits. Big Medicine like Big Agriculture is all about Big Profits. Soon medicine will be for the rich the same as food and clean water. We must find ways to stop this downward flow of resources meant for all populations and not just the wealthy. Pingback: Ebola, the Vaccine from Nazis, by Anonymous* | 2012: What's the 'real' truth? Pingback: BREAKING: Open Letter to Vladimir Putin on Ebola | 2012: What's the 'real' truth? I am well aware of the role of Robert Gallo and Fort Detrick in the apparent creation of the HIV virus. I was engaged in AIDS research myself (from a treatment perspective) in the late 1980s and was advised by the Seattle police to stop as I was potentially endangering my life. This was around the time Ted Strecker and Douglas Huff (an Illinois legislator) suddenly turned up dead for trying to publicize the true origin of HIV. I wrote about this in my memoir The Most Revolutionary Act: Memoir of an American Refugee. Gee, the rise in cancer of all types may well be the result of the secret depopulation eugenics agenda, that many have suspected but failed to embrace the reality, depth and scope of the operation. Perhaps all vaccines are laced with cancer, or EBOLA, AIDS, AUTISM, DIABETES…name your deadly designer disease. Pingback: EbolaGate: Rob Schneider – World Hero Speaking Up to Protect Everyone From Vaccine Killers . . . take your time and work your way through the FACTS in this article!!! ~J | 2012: What's the 'real' truth? Pingback: EbolaGate: US Marines Being Used as Patsies As Elite Activate Next Stage of Flu-to-Coup Plan | 2012: What's the 'real' truth? Re-blogged on ‘Finding Truth in an Illusory World’…. Thanks! Dr Mary’s Monkey is a joke. None of the accused are even alive to defend themselves.